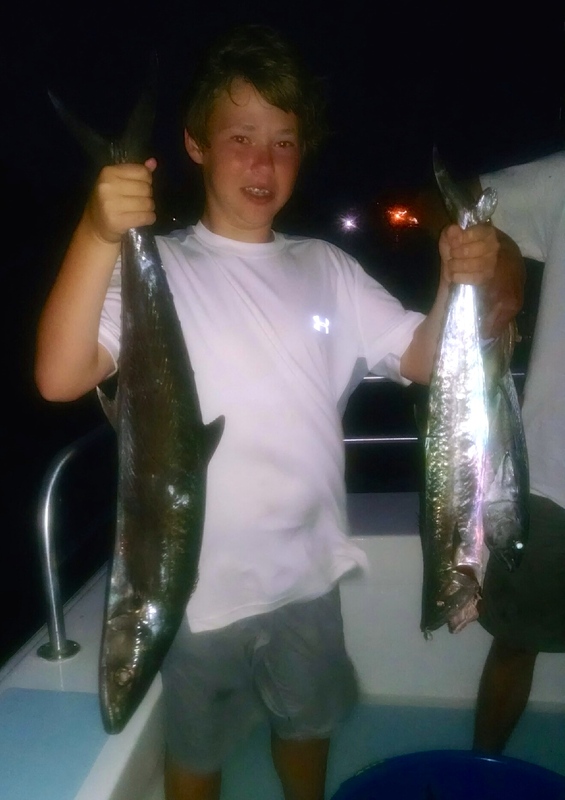 Near Shore Trolling charters target Gulf of Mexico fish species that travel along the beaches of the Alabama Gulf Coast and the mackerel BITE HAS BEEN ON since late July 2014. Both spanish & king mackerel are thick in the near shore waters (within sight of land) of the Gulf Shores, Orange Beach, Fort Morgan AL, and Perdido Key FL beaches. Trolling is a type of fishing where a couple of lines are used to drag behind the fishing vessel while the boat is moving. The bait is kept moving near the top of the water to attract these pelagic fish species such as mackerel, bonita (also known as little tuny) jack crevalle and various other gulf of mexico fish species. Once a fish nibbles on the line, the mate will pass the line to one of the anglers to reel in the fighting fish. The Alabama Gulf Coast is a popular destination for families traveling with their children on vacation. 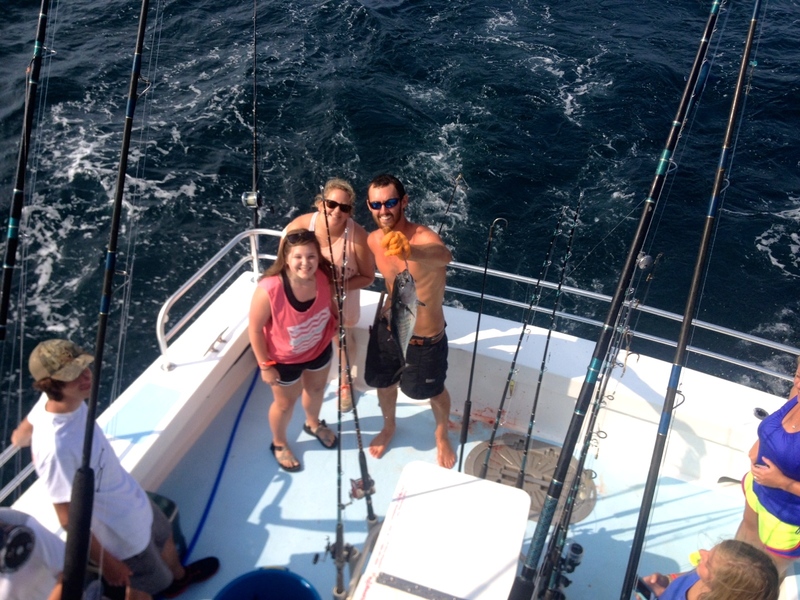 Gulf Shores AL deep sea fishing trolling trips offer a great setting for quality family time fishing in the Gulf of Mexico. If your group prefers to have a boat for themselves, private near shore fishing charters can be arranged for any size group. 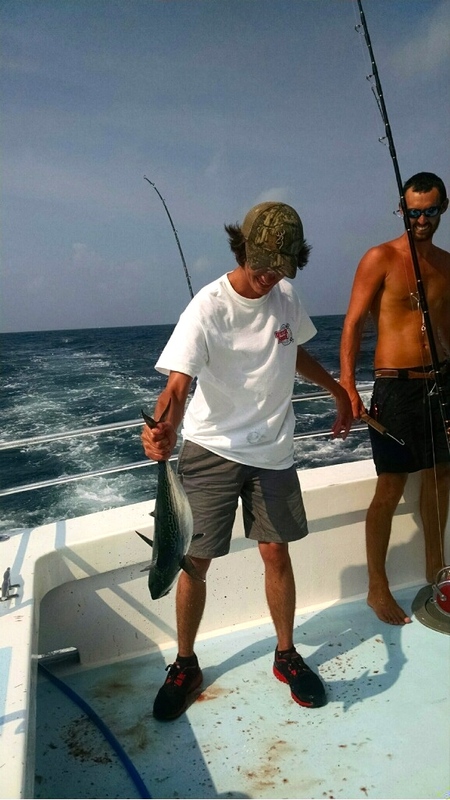 AAA Charters also specializes in matching groups together to charter semi-private fishing trips (these are also known as walk 0n or shared expense charters). We take the time to talk with each of our customers to understand their group and what type of fishing appeals to them the most, and then pairing them together with similar anglers for a charter. Call AAA Charters at 251-609-2525 for details and reservations. 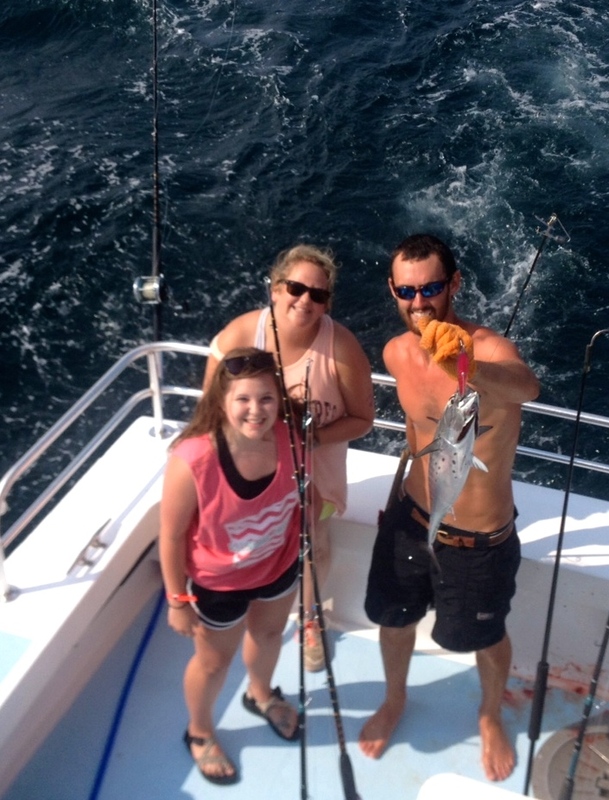 Four Arizona Lady Anglers Traveled to Alabama to Battle a Shark & they did! AAA Charters matched a mom traveling to AL with 3 teenage girls to shark fish, with a father with two boys that wanted to fish in the Gulf. During the afternoon semi-private fishing charter, everyone had lots of opportunities to reel in fish. 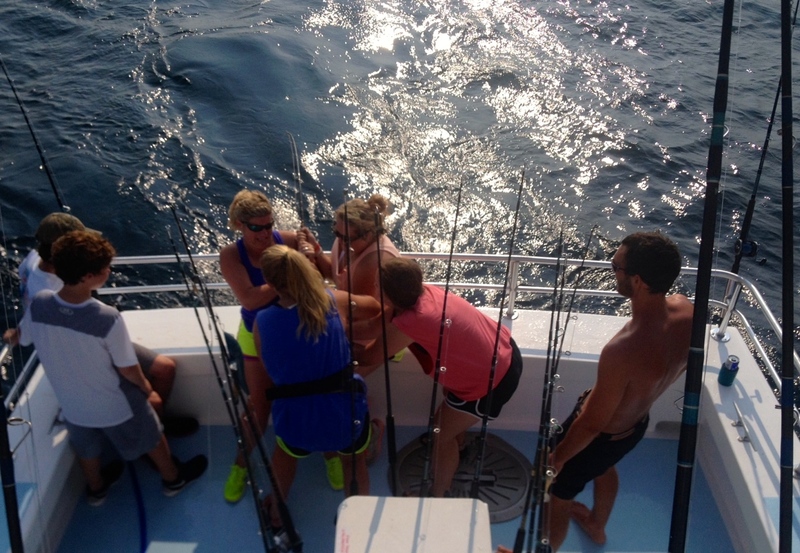 When a large shark was on the line, all 4 Ladies helped with the reel. They took a few pictures and let the shark swim away. All the kids came back to the dock with big smiles. 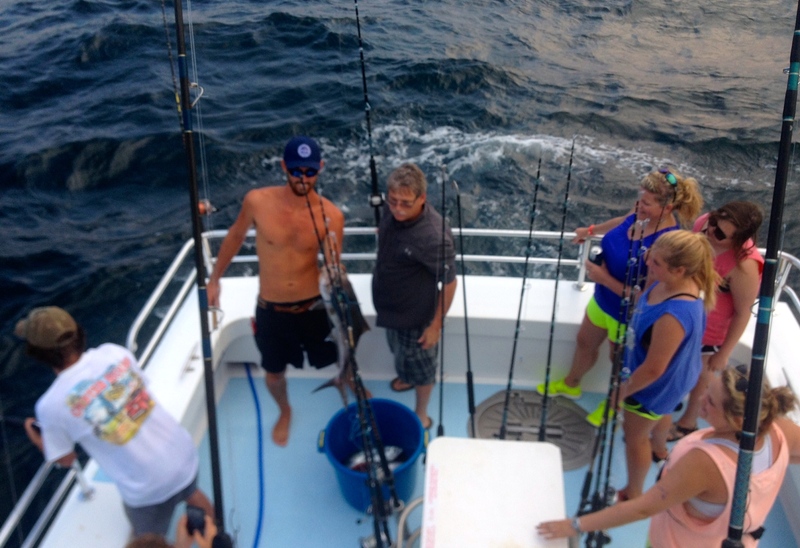 This entry was posted in Fishing, News and tagged affordable family fishing, affordable fishing charters alabama, AL gulf coast mackerel fishing, alabama trolling trips, deep sea fishing orange beach al, gulf shores al deep sea fishing, gulf shores al offshore fishing, gulf shores semi private fishing charters, gulf shores shared expense fishing trips, orange beach al walk on fishing trips on August 1, 2014 by AAACharters Team. Several times a year AAA Charters arranges for a Gulf Coast University to charter a multi-passenger fishing vessel (with a large, round live well) to collect live red snapper to transport back to spawning tanks. The goals of these trips include: improving our understanding of red snapper reproduction; creating ideal breeding conditions for the red snapper in captivity; and ultimately releasing as many red snapper as possible back into the Gulf of Mexico. The Gulf of Mexico sharks that typically gather along our shores in the summer months added an extra challenge to our latest research trip. Sharks are attracted to the smell of bait in the water and the commotion created while deep sea fishing. The weather was perfect, the marine conditions were ideal, and quite a few sharks ate well targeting the reef fish our research anglers were trying to reel in. For the purposes of this research project, 6 lb – 8 lb. live red snapper needed to be collected because this is the size red snapper that are sexually mature, and have the highest survival rate in captivity for breeding. 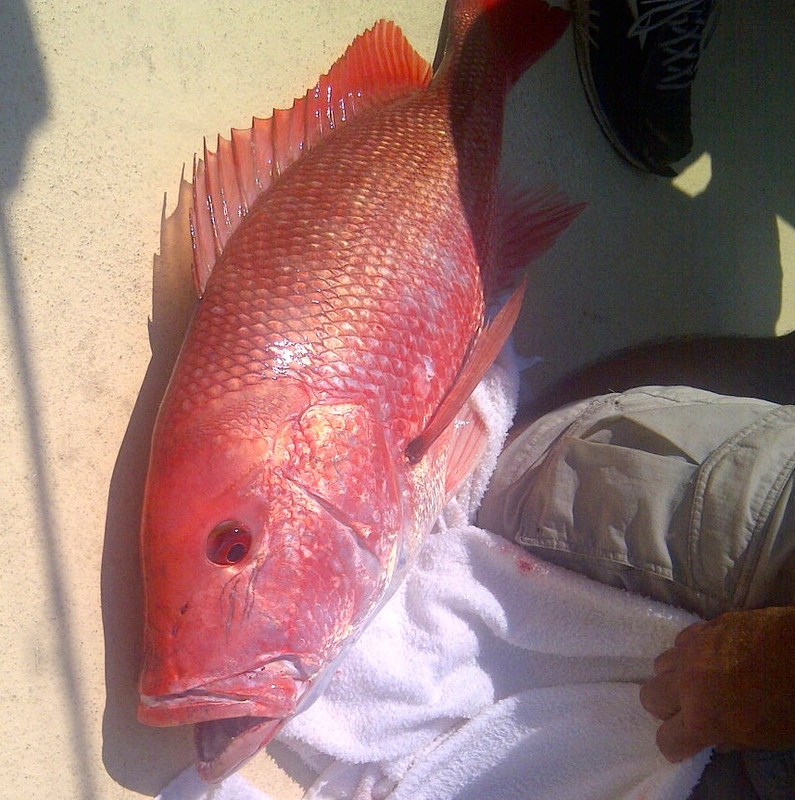 A few of the snapper caught were too small; but many were too big for the saltwater tanks. 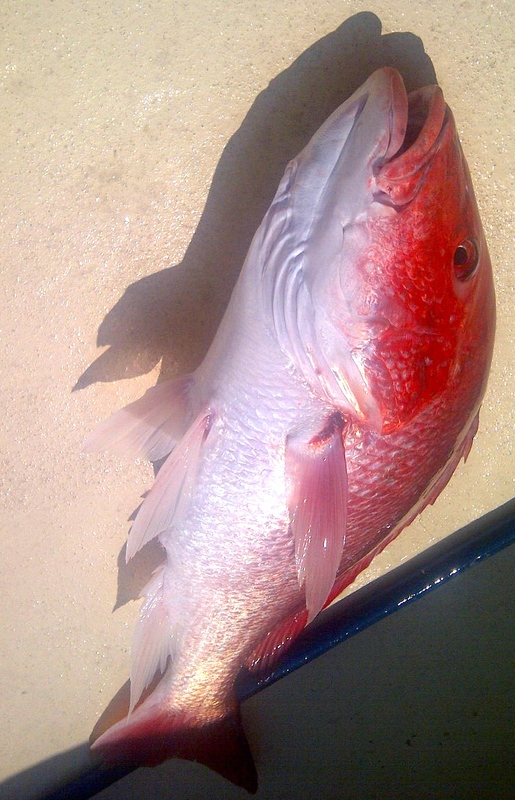 There are still lots of big red snapper off the coast of Alabama. The target size fish were kept in a large round live well, and then moved to large transport tanks to be trucked back to the Sea Lab. Too big for the snapper spawning tanks so back into the Gulf it went. While targeting red snapper the crew caught a bonus tasty Gulf of Mexico delight, Cobia (also known in other areas as lemon fish or ling). The peak of the Cobia fishing occurs in late March & April when they migrate from East of the Gulf towards LA and TX; but occasionally we land Cobia other times of the year while bottom fishing for reef species. Gulf of Mexico Cobia – A Tasty Treat! 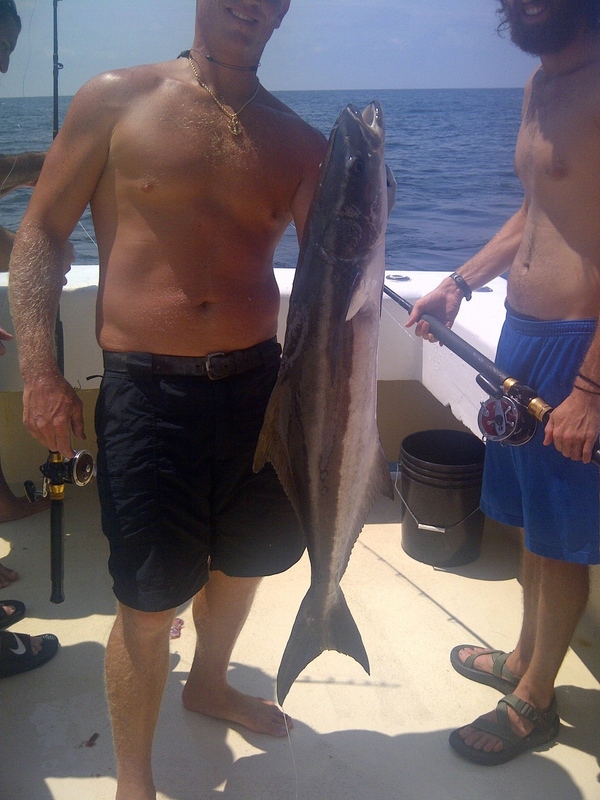 This entry was posted in Fishing, News and tagged alabama bottom fishing, alabama cobia fishing, alabama deep sea fishing, alabama snapper fishing charters, bottom fishing alabama gulf coast, deep sea fishing tours orange beach al, gulf of mexico fishing, gulf of mexico red snapper research, gulf of mexico sharks, gulf shores al deep sea fishing, gulf shores al fishing trips, gulf shores cobia fishing charters, orange beach al offshore fishing, red snapper fishing alabama on July 17, 2014 by AAACharters Team. 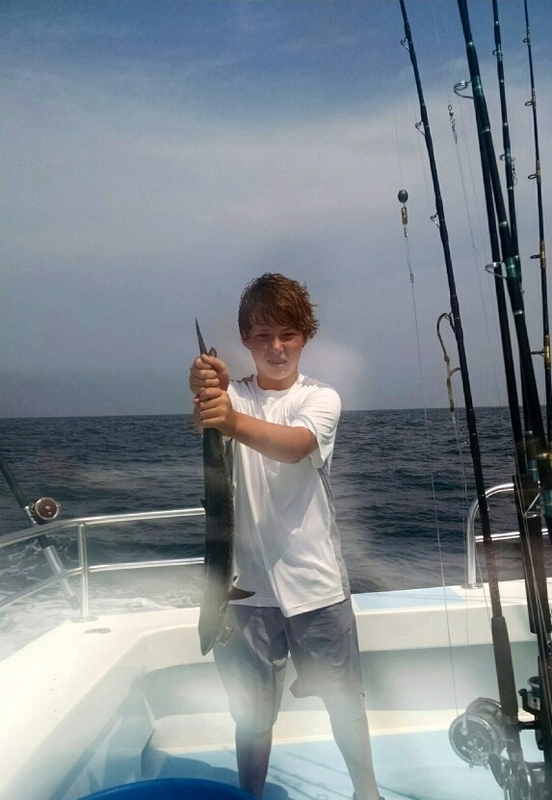 There is still time to arrange a deep sea fishing charter with your father this Sunday June 15! Join a Captain with over 30 years of experience fishing in Florida State Waters to troll and bottom fish for a variety of species that live along the coast of the Gulf of Mexico. 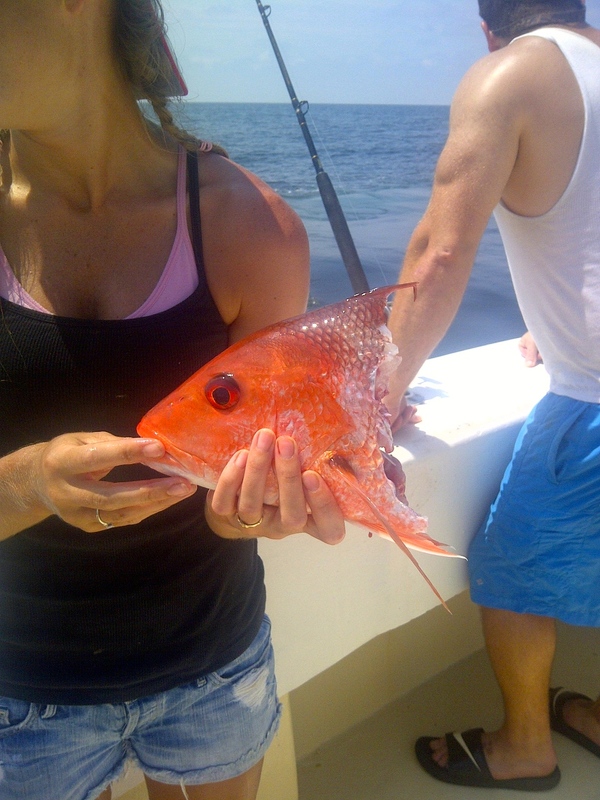 Very few boats in the Alabama fleet have the ability to harvest red snapper or triggerfish this summer; but ONE of our boats is still available for charter this Sunday that can BRING IN RED SNAPPERS & TRIGGERFISH. This is a spacious six passenger fishing charter boat (also known as “six packs”) that features an air-conditioned cabin with a seating area, a marine head for your convienence and comfort, and a grill available for your use. The marine forecast is ideal (1-2 ft seas) for enjoying a day of fishing and relaxing with your family & friends. 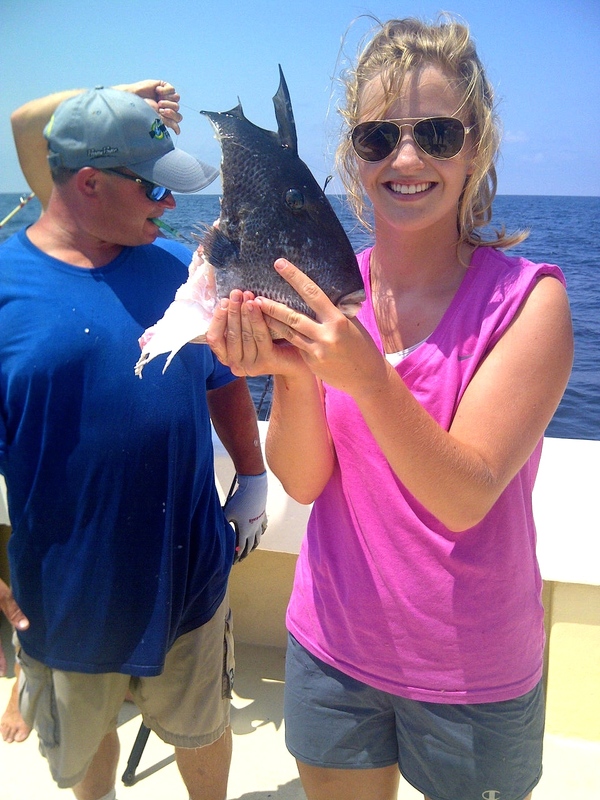 What are we catching on our Orange Beach AL fishing charters? Snappers like these! 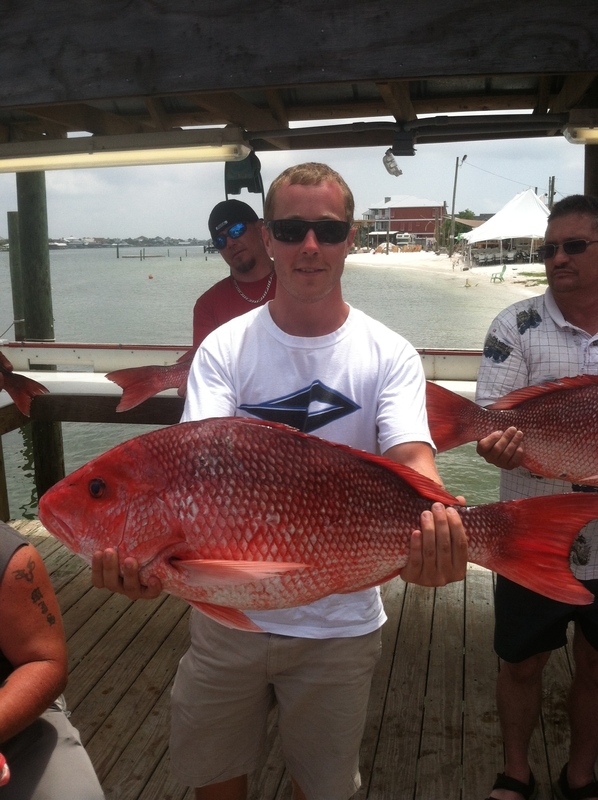 Despite 3 ft. seas, this Talladega AL Crew brought in some big, tasty Red Snappers! 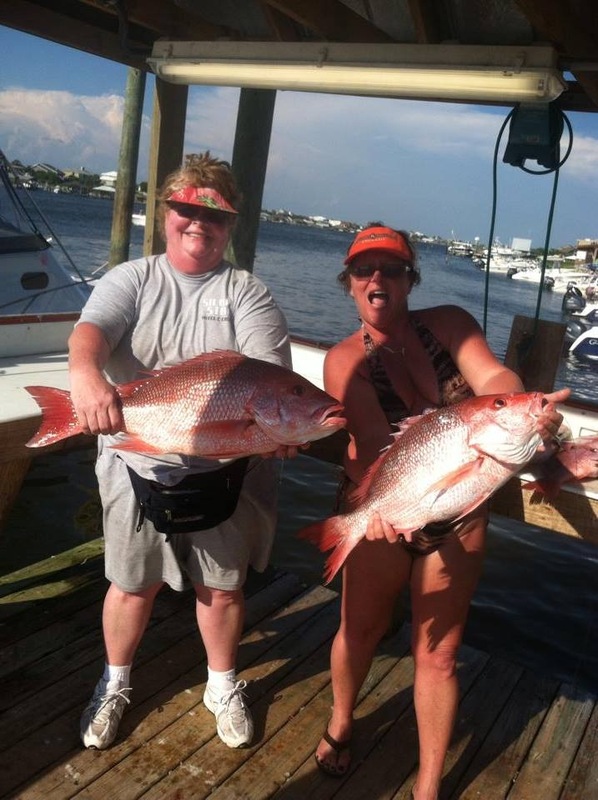 This entry was posted in Fishing, News and tagged alabama bottom fishing, alabama fishing, alabama gulf coast private fishing charters, alabama red snapper charters, bottom fishing alabama, fishing orange beach al, fishing tours gulf shores al, gulf shores al deep sea fishing, gulf shores fishing charters, gulf shores fishing tours, orange beach al deep sea fishing, semi private fishing trips, what we catch orange beach al on June 14, 2014 by AAACharters Team.